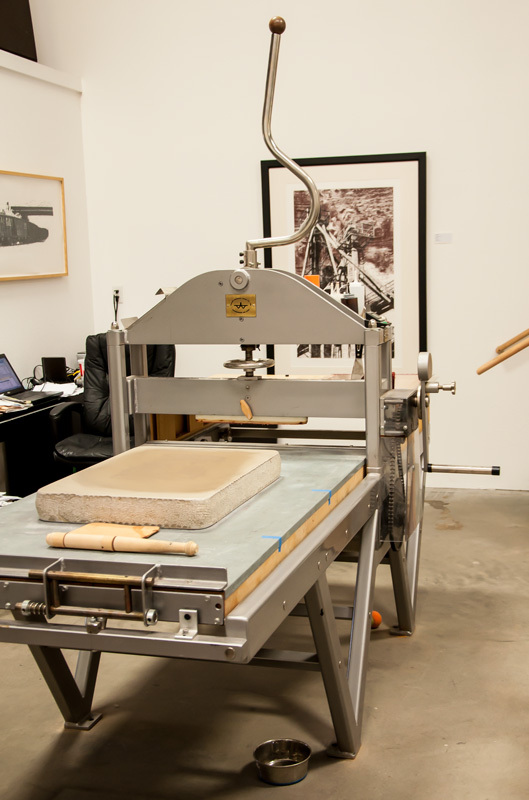 There are two presses in my studio. I talked previously about my etching press, which is the larger of the two. 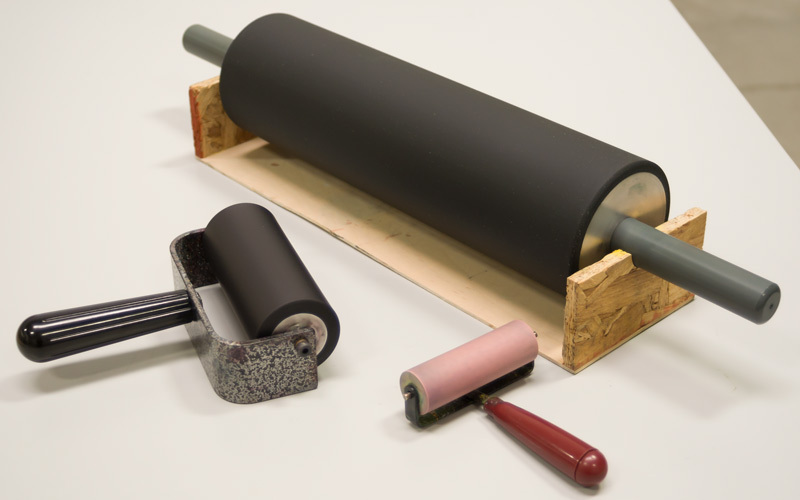 The other press is a Lithographic (‘litho’) press. It is a Takach-Garfield press with a 34″ x 60″ bed. At first glance, it would seem to be very similar to the etching press, but a closer look will show that they are, in fact, very different, due to the very different requirements of the processes that they support. 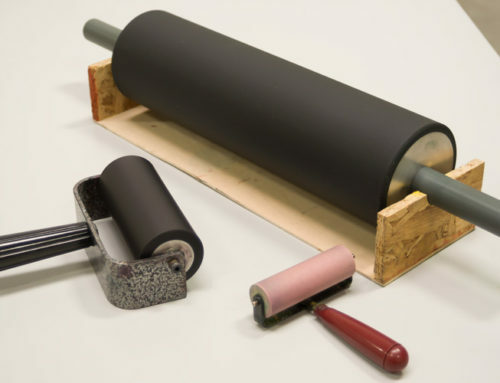 A litho press does not have an upper pressure roller. Rather it uses a scraper bar that has pressure applied to it through a cam and adjusting mechanism by a long pressure arm. 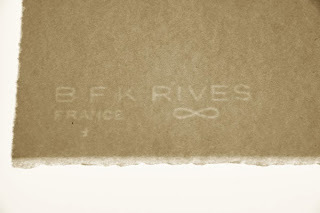 A lithograph is printed from a stone (yes, it really is a slab of limestone). 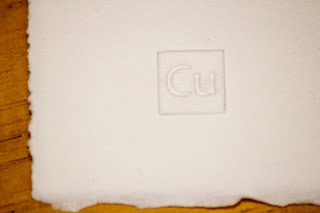 When printing, the image on the stone is inked, the paper placed on it and then a protective sheet called a tympan is placed on top of the paper. 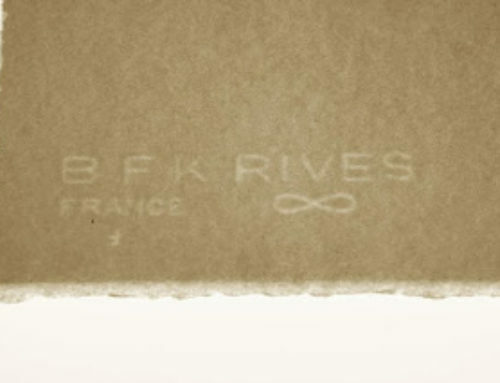 This is usually either a sheet of plastic (polycarbonate) or a plastic impregnated fabric. 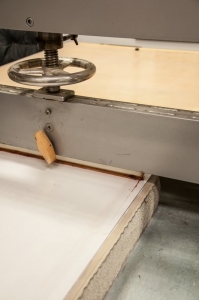 The tympan protects the paper and helps distribute the printing pressure. 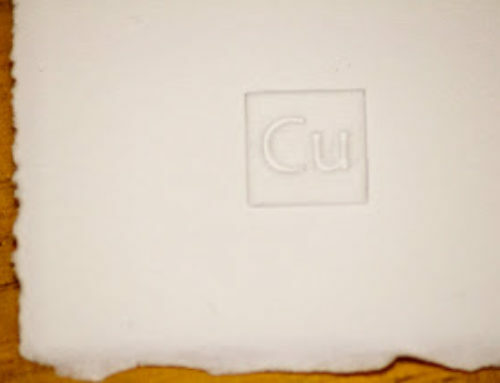 The actual printing pressure is delivered by a scraper bar. 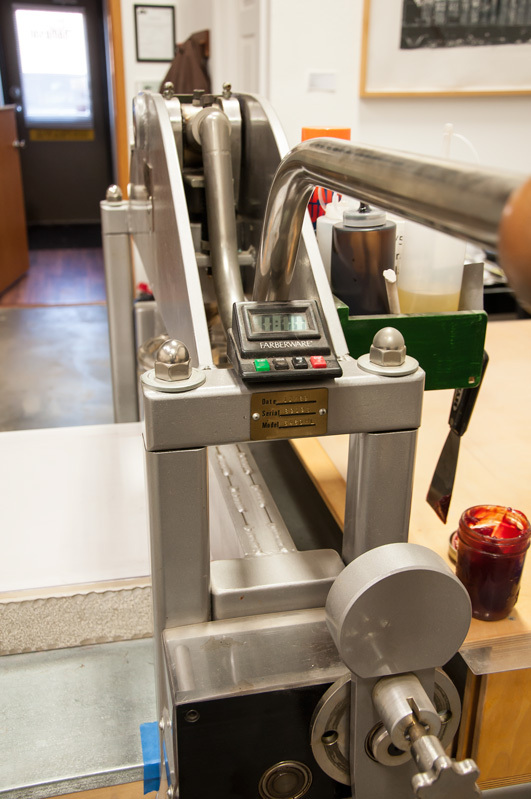 This is a long block of plastic that is tapered to about 1/8″ wide at the point of contact. There is a strip of slippery plastic tacked over the face of this. The scraper bar is brought down into contact with the tympan and a tremendous amount of pressure is applied. 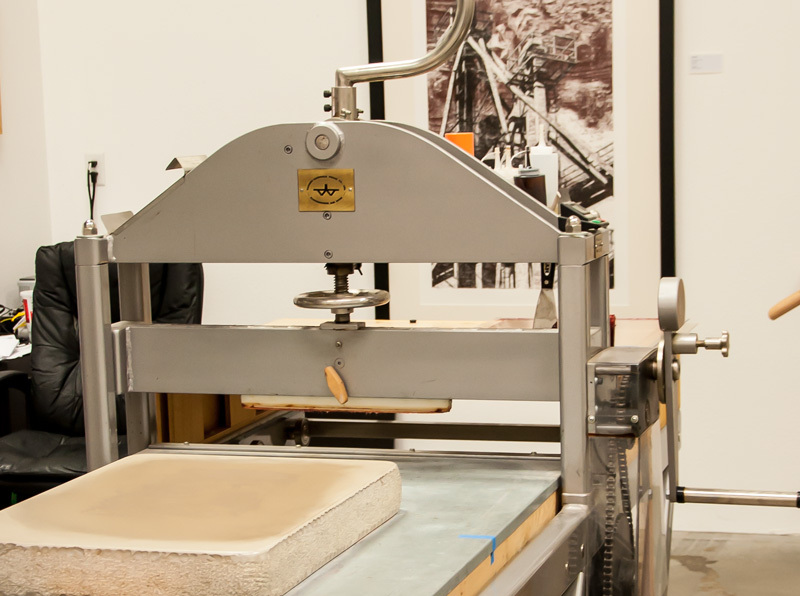 The bed of the press is then moved past the scraper and it forces the paper into contact with the image on the stone. 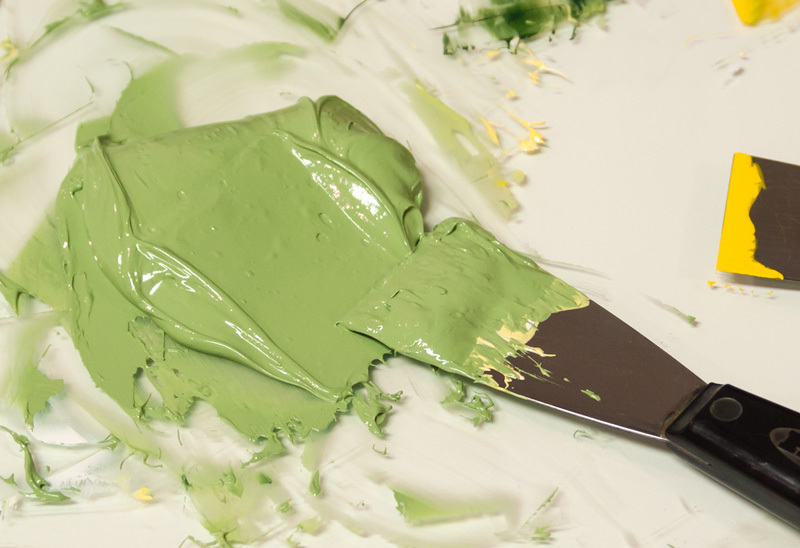 To make sure all this works smoothly, the surface of the tympan is greased (tympan grease). The pressure arm fully lowered. You can also see the pin that engages the crank for the bed. The scraper bar is raised and lowered by the pressure arm. This long arm swings through 90 degrees of travel and provides the press operator a lot of leverage. 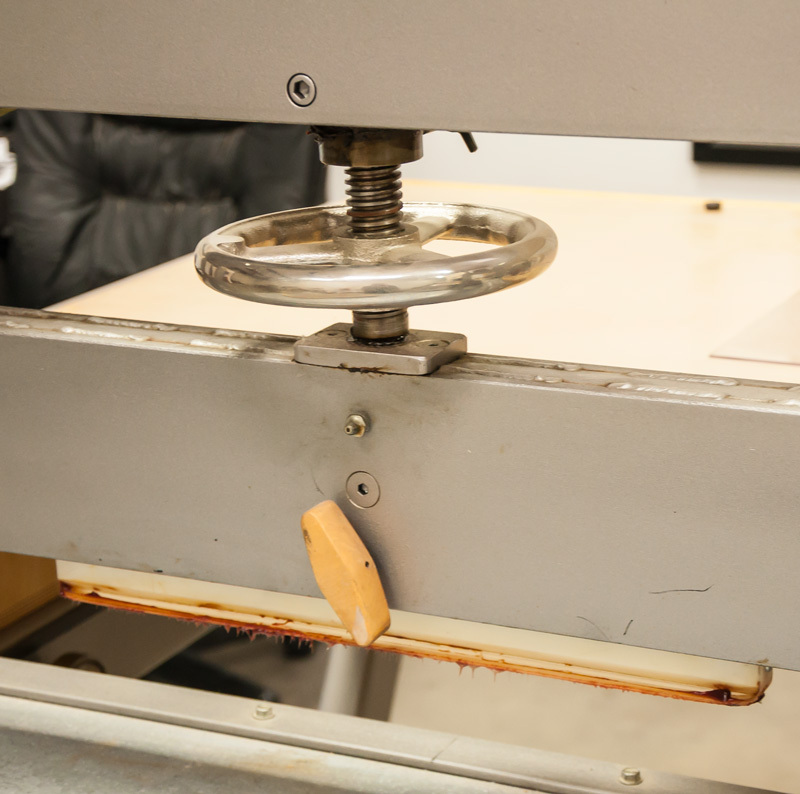 There is a cam in the mechanism, so that in the last few inches of travel, the pressure increases greatly and goes ‘over center’ so that the pressure stays on while the printing occurs without having to hold the arm down. A scraper bar with some tympan grease clinging to it. 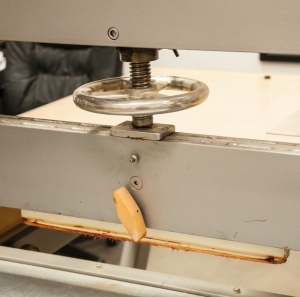 The hand wheel is used to adjust the pressure applied. The pressure is adjusted with a handwheel. During setup you would back off the pressure and lower the pressure arm. Then you adjust the handwheel until the scraper bar is just snug against the tympan and stone. You then raise the bar and just tweak the handwheel a little tighter (perhaps 1/8 turn) and lower the arm again and you will feel the pressure go ‘over center’. It is all adjusted by feel. Ready to print. The bed in position with stone, paper, tympan, tympan grease, scraper bar under pressure. 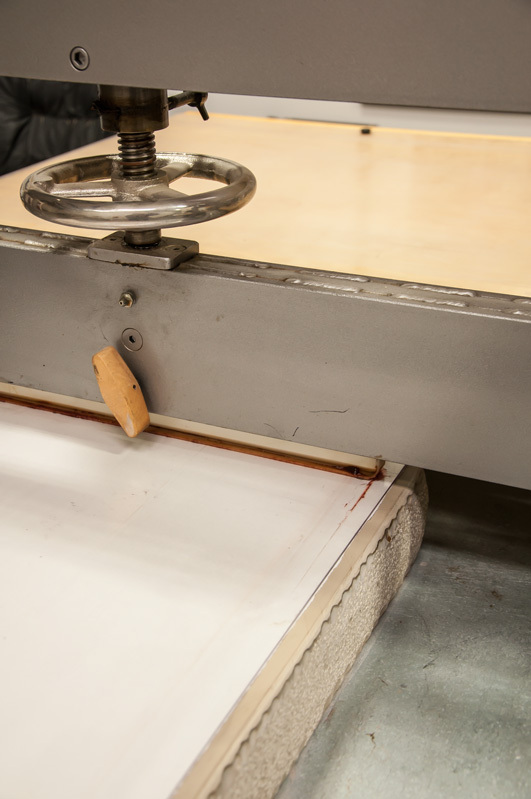 The bed of the litho press is also different in a couple of ways. First, the construction is different. It has a laminated wood bed, but then there is a little padding covered by a sheet of galvanized steel. This surface supports the stone, but is also just slightly resilient. 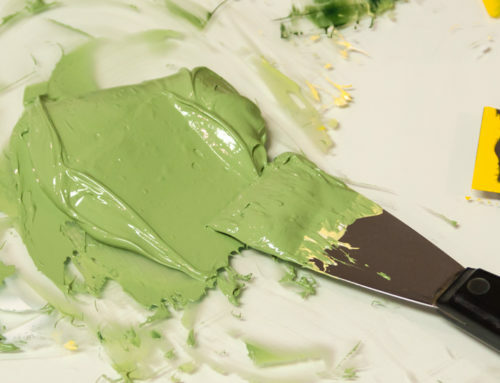 Stones are brittle and you don’t want to break one because of high pressure on an uneven surface. This resilience helps protect against that. The bed is also not engaged full time. In it’s normal position, it is latched and the crank is disengaged. 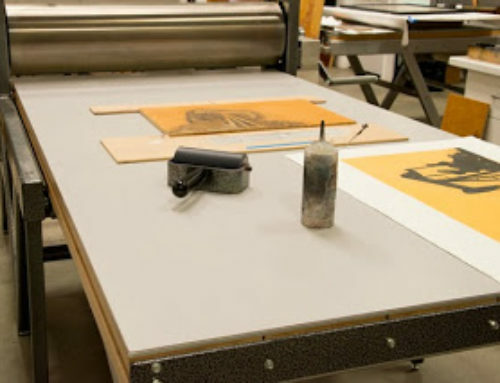 When you are ready to print, you disengage the latch, push the bed into position by hand, lower the pressure arm and then engage a pin which connects the hand crank. You then crank the bed through the print cycle. At the end, you raise the pressure arm, disengage the pin and move the bed back by hand until it latches into place.